I love finding good quality literature for my girls to read or to read aloud as a family. The Schoolhouse Review Crew was offered 12 different books from Salem Ridge Press and we chose A Sea-Queen's Sailing. We reviewed 3 books from them a couple of years ago & we enjoyed them so much I knew we wanted to read more from them. We choose to read A Sea-Queen's Sailing because it contained bravery and adventure while still honoring women. I read this book out loud to my family during our evening read aloud time. All three of my girls (ages 8, 10, & 12) enjoyed this book and begged for one more chapter each night. One night we stopped reading with only 3 chapters left & my husband knew he would be at work the next evening & would miss what happened at the end, so as soon as the girls headed to bed he had to finish the book. Of course the girls didn't think that was very fair. 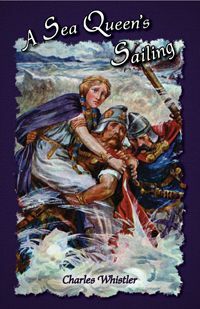 A Sea-Queen's Sailing is about strong courageous men who uphold and honor women by vowing to protect a queen in 935 A.D. Malcolm the Jarl from northern Scotland is taken captive by Heidrek the Seafarer. He manages to escape with an Irish prince and an English thane. With Adventure and Danger they save Queen Gerda and vow to protect her & help restore her kingdom which has been overtaken by her evil cousin Arnkel. The first chapter is available online. We enjoyed this book for a lot of different reasons. My husband & my 12 year old daughter were more into the adventure. They loved the battles & storms that were endured. My 8 & 10 year old enjoyed it for the Queen, they love to pretend they are royalty and need to be saved by their knight in shining armor. I liked this book not just for the story line, but for the cleanliness of the book. It didn't contain any words that I needed to skip, the fighting was not overly descriptive & gruesome, and the love story was very pure. I love that Salem Ridge Press is bringing back books that my family can enjoy without compromising our beliefs. A Sea-Queen's Sailing was written by Charles Whistler and it was originally published in 1906. This historical fiction is a 310 page paperback book recommended for ages 12-adult. It has been republished by Salem Ridge Press & can be purchased for $14.95. Sail over to the Schoolhouse Review Crew Blog to read reviews of other Salem Ridge Press titles.